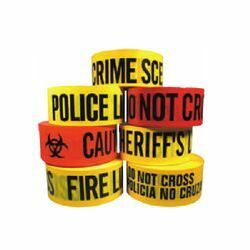 Providing you the best range of warning tape, caution tape, message stand and reflection caution tape with effective & timely delivery. 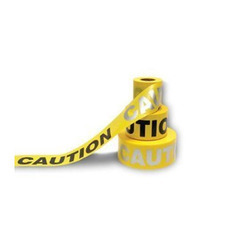 as an effective way of highlighting dangerous/accident sites/accident prone areas, these Warning Tape feature strong and highly visible construction finish which makes them visible from long distances as well as in poor lit areas. Available in polypropylene and other material based construction choice, we can offer these in different lengths packaging as per the specific demands of the customers. Offering support as non-adhesive barricade tapes, these are both lightweight and economical in usage and allow clear marking of potentially dangerous areas. We make these tapes available in bright colored finish in single/two color striped finish as well as with custom message support as per the specific requirements of customers. 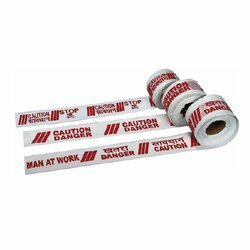 Some of the advantages of these tapes include easy visibility to catch attention of passersby, preventing accidental entrance to defined areas and others. Some of the applications these are used in include as police tapes, firefighter tapes, traffic control tapes and others. 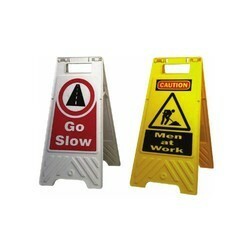 Available in different construction finishes, these Caution Tapes are available in durable construction and tear resistant finish. Finding use as barricade tapes, these are developed from tear-proof plastic materials like nylon, polyethylene, polypropylene in different thicknesses and customized message choice as per the specific demands of the customers. With some common sizes these tapes are available in including 2, 4 or 6 inches wide and 4 or 10 mm in thickness, these tapes find use at accident sites, accident prone areas, work areas and other places. Some of the advantages of these tapes include non-adhesive lightweight finish, economical in usage and possibility of reusing it. Displaying continuous message stream, these tapes make use of reflective ink for messages which makes them easily seen even in poor light conditions. Quick and effective way to highlight dangerous areas. Available in multiple style choices, these Message Stand options can be made available in both standard as well as custom developed finish as per the specific demands if the customers. As free standing sign displays, these floor standing fixtures can be used in both indoor and outdoor locations as per the specific end usage requirements. Here, our expertise lies in offering this floor stand displays in numerous construction designs with each one of them offering optimum visual display and communication support. Some of its advantages include lightweight construction finish which makes these easy to move, allowing easy and convenient display support anytime and anywhere and perfect suitability for areas like restaurants, lobbies and other similar places.